It was the morning of Monday, 18 April 1942 and, taking a final look at the carrier rapidly disappearing into the distance, the B-25s headed west on what each of the five man crews knew was a one-way ride. With luck they might make it to Nationalist China but first they had an important mission to complete - destination Tokyo! Richard Taylor’s powerful painting depicts the scene immediately after the Raiders had carried out their mission. 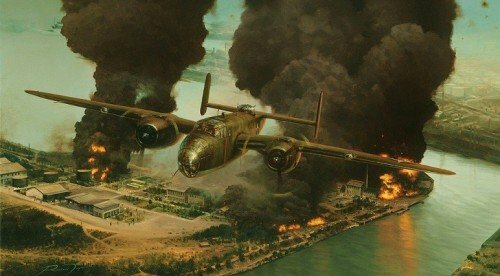 One of the last B- 25 Mitchell's, having successfully bombed its target, makes its escape towards mainland China. As the navigator sets the new course, their path takes them close to targets hit by other Raiders, dark columns of smoke rising rapidly from the burning oil and carnage below. 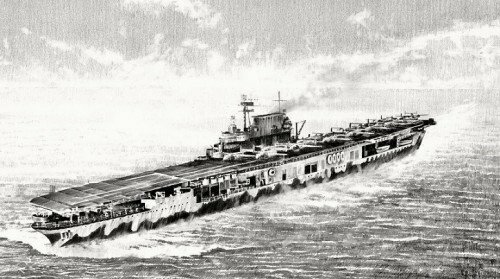 Overall Print Size:29” x 201/2"
Issued with a copy of Richards pencil print, USS Hornet, every one of these historic two print portfolio's is personally signed by Doolittle Raiders and a crewmember of the USS Hornet during the raid. This will prove to be one of the most important editions in Richard Taylor's growing portfolio, providing what could be one of the final opportunities to acquire a limited edition signed by the last surviving veterans of the legendary Doolittle Raiders. THE LIMITED EDITION Along with artist Richard Taylor every print is personally hand signed by THREE veterans that took part in the Doolittle Raid: Lieutenant Colonel RICHARD E. COLE The co-pilot of General Doolittle’s aircraft, B-25 #1 which attacked the city of Tokyo. Staff Sergeant DAVID J. THATCHER The Flight engineer and gunner on B-25 #9 which attacked Tokyo Bay in the town of Kawasaki. Master Sergeant EDWARD J. SAYLOR>THE TRIBUTE AND REMARQUE EDITIONS Every print in these exclusive Editions is additionally signed by another legendary Doolittle Raider, creating an outstanding FIVE signature collectors portfolio. Major THOMAS C. GRIFFIN The Navigator on B-25 #9 which bombed Kawasaki on Tokyo Bay. Brigadier General EVERETT HOLSTROM (matted) The Captain and pilot of B-25 #4 which bombed Tokyo. Colonel HOWARD SESSLER (matted) The Navigator and Bombardier on B-25 #15 which attacked Nagoya. Captain ROYDEN STORK (matted) Co-pilot of B-25 #10 that attacked Tokyo. Major GRIFFITH WILLIAMS (matted) Co-pilot of B-25 #15 which bombed waterfront targets at Kobe.